As the amazing and previously undiscovered properties of Jet Fuel A continue to mount, I find the enclosed photgraph to be one that tops them all. I just love showing this picture to "clingers of the official fairy tale". I ask them how Jet Fuel can burst the lobby of the World Trade center in a purported huge fireball, yet leave not a trace of smoke or soot, then leap across the street and do significant damage to an adjacent structure, prior to any collapse mechanism, or any apparent fire of the WTC tower it supposedly came from. Usually they mutter something about gas mains rupturing, but gas mains are just that, mains, (they run down the center of a street in a utilities chase), and then branch off into various metered lines to serve customers. In summary, I've never seen an entire fire brigade park on top of a ruptured gas main. So, short of an explosive device, what other mechanism expains the damage to the adjacent structure? I'll play the devil's advocate, which is what we need to be doing constantly. The dark windows are simply those with the blinds pulled up. You can't really show that they are in fact broken. As for the broken windows in the WTC, those could have been caused when the plane hit and made the building sway excessively. Anonymous (not verified) on Sat, 12/09/2006 - 12:27am. "As for the broken windows in the WTC, those could have been caused when the plane hit and made the building sway excessively." First of all, the amount of sway is proportional to the distance from the pivot, i.e. the base of the tower. So if even the lobby windows were destroyed by it, all windows above would have been damaged as well. There would have been a glass blizzard the moment the planes hit. bruce1337 on Sat, 12/09/2006 - 1:00am. We do need to be able to provide better lobby devastation evidence. It has to out there, right? Anonymous (not verified) on Sat, 12/09/2006 - 1:32am. bruce1337 on Sat, 12/09/2006 - 1:41am. of the WTC also vividly described the explosions he heard and felt in the lobby, as well as the people who had their skin burned from the blasts. There is also seismic data as proof of the blasts deep in the foundation of the buildings, which occurred prior to the crumbling & disintegration of the entire towers. MrEguy on Sat, 12/09/2006 - 4:29am. the seismic data and Rodriguez' testimony suggest it occurred even prior to the airplane impact. bruce1337 on Sat, 12/09/2006 - 4:50am. On September 11, 2001, the seismic stations grouped around New York City recorded seismic events from the WTC site, two of which occurred immediately prior to the aircraft impacts upon the Twin Towers. Because these seismic events preceded the collisions, it is clear they were not associated with the impacts and must therefore be associated with some other occurrence. None of the authorities charged with the responsibility for the investigation of the events of 9/11 have proposed a source for these seismic events, nor have they given a valid reason for the difference in times between the seismic events and the aircraft impacts. Only by consideration of the evidence of basement explosions before the aircraft impacts, as experienced by William Rodriquez and 36 others, can an explanation be found for the fact that the seismic stations recorded seismic events originating from the WTC sites prior to the aircraft impacts. It seems unlikely that Middle Eastern terrorists could have overcome the WTC security and managed this kind of high-level, technological coordination. Do the facts presented here, simple and few, raise the possibility of inside involvement in 9/11/01, both before and after the attack? imgstacke on Sat, 12/09/2006 - 11:54am. 9/11 WAS AN INSIDE JOB!!!! This is a bitter reality people. Reality is not always easy to take in. It is like watching a horror movie but with a different dialogue. We have WMDs drop on the american people. And they are weapons of mass delusions force on the american people. That should produce even enough outrage and strong outrage as CNN and FOX likes to use when the idea of conspiracy is brought up. To me nothing is more american then to question authority and the government. Wrh03 on Sat, 12/09/2006 - 12:46am. Listen, I wasn't denying it was an inside job. I'm just saying we need to be as rigorous as possible. We're not trying to convince each other here. We're already in the know. We need to be providing incontrovertibel evidence to people and the Rodriguez testimony and the Laudet video is pretty good. rollo on Sat, 12/09/2006 - 11:06pm. I would suggest that if the adjacent structure is closely examined, there is clear evidence of damage. Many window blinds are askew in their frames, most notably the ones in the upper right corner of the yellow square. And as for the darkened windows, they show not a trace of reflectivity. To me, they look to be missing entirely. Also would note the facia of the building appears sooty and darkened, yet the WTC Tower is sparkling clean. I have no explanation, only posit this piece as another unexplained piece of the puzzle. And thank you all for your very cordial and welcome comments. For my part, whatever anguish of spirit it might cost, I am willing to know the whole truth; to know it - now"
craniac on Sat, 12/09/2006 - 9:56am. This looks Photoshopped to me. Look at the diagonal outer beams of 6WTC and the round, black spots on 1WTC. Anonymous (not verified) on Sat, 12/09/2006 - 1:01pm. 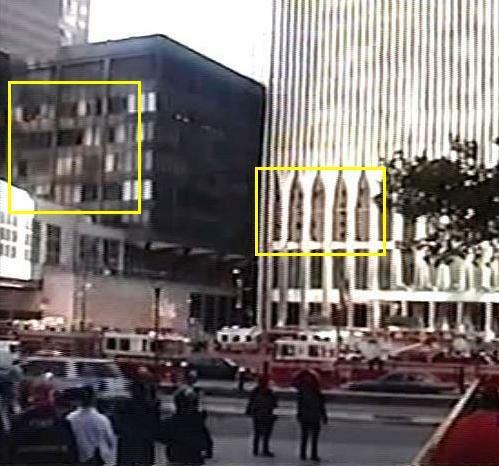 Is that an "Airstream" trailer at the bottom left of the WTC? Looks out of place and oddly tilted. This view is from the west, between 9:00 and 10:00 in the morning. JohnGault on Sat, 12/09/2006 - 3:04pm. JohnGault on Sun, 12/10/2006 - 10:12am. Do you know of more photo's taken from this angle around about this time ? travellerev on Sun, 12/02/2007 - 7:14am.